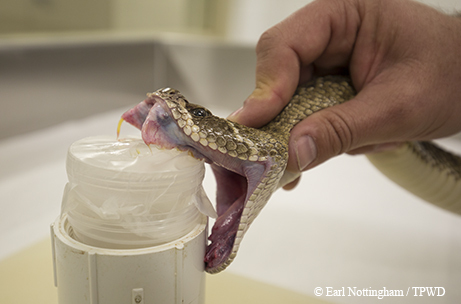 Secrets of the Serpentarium: Texas A&M-Kingsville lab explores beneficial uses of snake venom. After putting up a strong fight amid a patch of sunflowers, a large western diamondback rattlesnake was caught in a residential neighborhood in the pre-dawn hours of an otherwise ordinary day last spring. It happened to be May 4 (as in “May the Fourth be with you”), a day celebrated annually by Star Wars fans and pun enthusiasts. So when the snake was brought to its new home, a fairly nondescript beige-colored brick government building in Kingsville, the staff gave him a new name: Luke. The choice was more apt than those who made it may have realized. In the beginning of the original Star Wars trilogy, Luke Skywalker is going about his tedious, chore-filled life as a farmhand until fate unexpectedly intervenes. Soon, he finds himself traveling to places he never imagined as a central player in an ever-intensifying intergalactic battle between good and evil. To get through it, he must learn to properly channel his innate connection to “the Force,” a source of power that his enemies can also use for their own dark purposes. On that fateful May morning, like his namesake, Luke the rattlesnake was abruptly yanked — in this case, by a long stick — into a new environment, one that would require him to harness his natural venom-producing abilities. While certainly an effective means of defense and killing prey, Luke’s venom, from here on out, would be used to save lives. Luke is now one of roughly 450 venomous snakes that call the John C. Perez Serpentarium home. He’s unique in that he has a pet name to go along with his nine-digit identification number. His fellow tenants are an international bunch, including species typically found on the other side of the globe, like the red spitting cobra or the Gaboon viper. The serpentarium is part of Texas A&M University-Kingsville’s National Natural Toxins Research Center. Through its own research, and through the venom it provides to other researchers throughout the country, the center has been a critical player in efforts to find productive uses for the toxins found in snake venom. Molecules in venom that prevent blood from clotting — with the aim of getting the snake’s prey to bleed to death — are now used in drugs aimed at treating strokes, heart attacks and high blood pressure in humans. Molecules derived from snake venom are used to fight cancer. Snakes have different ways of reaching the center. Some, like Luke, are captured and given to the center. Others have been donated by zoos or law enforcement. A fire department in Tucson, Ariz., holds onto snakes that firefighters have captured from houses until someone from the NNTRC can come pick them up. “A lot of people are willing to help,” says Elda Sanchez, the executive co-director of the center. Other snakes have been procured on official snake hunts. Growing up, Sanchez could not have known how much of her career would be spent inching along remote West Texas roads in a truck on cool nights hoping to spot snakes that had crawled onto the asphalt to soak up the radiating warmth. Typically such an excursion might yield about three snakes, she said, though one time they got 30 in one night. It has become common practice for venom labs to maintain detailed records on each specimen, including the capture location (if it’s available). Venom components within a species can vary greatly from one region to the next. If researchers find a useful venom component in a certain sample, they can return to that exact snake in the lab for more venom. By knowing where the snake was captured, researchers could even return to the original population to gather other specimens for further research. 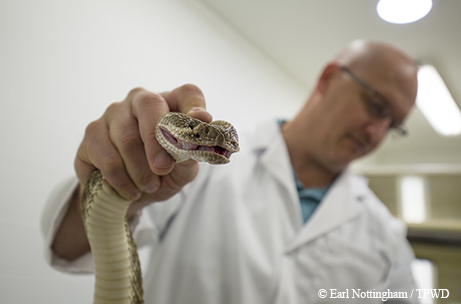 The snakes at the serpentarium are serving a noble purpose: providing high-quality venom to researchers and helping reduce the impact of snakebites. In the U.S., between 7,000 and 8,000 individuals are bitten by venomous snakes each year, and the number of fatalities is in single digits. By contrast, many more Americans die from bee, wasp and hornet stings (58) and car crashes (33,000) each year. Elsewhere in the world, the odds of dying can be much higher, and estimates put the annual number of global snakebite fatalities at more than 100,000 each year. Snakebites must be treated with antivenom specific to the snake that did the biting, and some antivenoms are easier to come by than others. In 2014, the Department of Defense announced a desire for antivenom that could counteract a bite by any snake and could be administered by nonphysicians, which would improve the odds for troops on the ground in exotic and remote locations, far from medical facilities. Current antivenoms are created using antibodies from other animals and can sometimes cause allergic reactions in people. 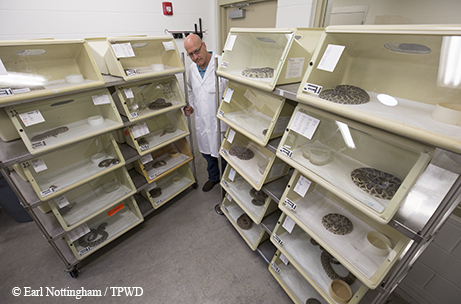 Curator Mark Hockmuller oversees the collection of about 450 venomous snakes from around the world, including rattlesnakes and cobras. In collaboration with a Houston-based company called AM Biotech, the NNTRC is in the early phases of testing a synthetic antivenom that would counteract all snakebites and diminish the risk of reaction. Like many drug development efforts, the end of the process is still decades away — and it will require a significant amount of venom from the snakes at the serpentarium. While it may not look exceptional from the outside, the 4,000-square-foot serpentarium is in many ways unlike anywhere else in the state. To my surprise, during a visit in December, I found that standing in the center of the building can be incredibly soothing — if your eyes are closed. It’s like standing underneath a small waterfall, or in a circle of slowly tilting rain sticks. Of course, if you open your eyes, you’ll see what some might consider the stuff of nightmares: wall-to-wall and floor-to-ceiling rattlesnakes. “You never want to get too comfortable,” says Mark Hockmuller, the serpentarium curator who shows me around. His responsibilities include extracting venom from between 20 and 30 snakes each day. Most of the snakes behave predictably when their time for extraction comes, though he said some of the more exotic snakes — including a monocled cobra that he is still getting used to — have a slightly longer reach and can be a bit trickier. But Hockmuller takes a calm, almost clinical approach. Unlike most people in his line of work, he says, he has never been bitten. Unless they are involved in venom research or happen to have visited on a school field trip, most Texans are probably unaware of the snake-filled building in Kingsville. We were talking on the phone as he walked to his lab in Boston, Mass., one of several places he might never have lived were it not for his getting involved in the NNTRC as an undergraduate. He was not the first — nor will he be the last — to realize that the center can change lives in other ways. Sanchez says that anywhere from three to eight students are working at the center and are involved in publications each year. Galan was among them at one point. He followed up bachelor’s and master’s degrees at Texas A&M-Kingsville with a Ph.D. at Purdue University and a postdoctoral fellowship at the University of Montreal. Now he is a research fellow at Massachusetts General Hospital. Sanchez’s own story is not that different. “I’m from South Texas,” she says. “Our experience was very limited. I never had any idea what research was, what researchers did or that there was a career for that.” She enrolled at what is now called Texas A&M-Kingsville in 1990 expecting to become a science teacher. After earning her bachelor’s and master’s degrees there, she received a Ph.D. from the Universidad Central de Venezuela, all the while staying involved in what is now the NNTRC. Her course shifted dramatically as an undergraduate when she was asked to help with some research being conducted by a biology professor named John C. Perez, the center’s founding director. Perez’s interest in venom got started in 1976 because of a gray wood rat. A student working in one of Perez’s labs had added the rodent to the dinner menu for one of the rattlesnakes under their care. It turned out to undoubtedly be one of the worst dining experiences in the snake’s life. “They would throw it in the cage, the snake would strike, but the wood rat just wouldn’t die,” Sanchez says. Sanchez was just a girl then, unaware of the incident and the effect it would have on her life, but the story is one she has since told countless times. Perez and his team began gathering up and testing other local fauna. It turned out that other animals, including opossums, hedgehogs and Mexican ground squirrels, were also immune. They began to dig further, embarking on what is now a four-decades-long inquiry into the properties of venom. When Sanchez arrived as an undergraduate, the center had about 50 snakes that were kept in a portion of an abandoned dormitory behind the campus police department. Over the course of her involvement, Sanchez has watched the collection grow to nine times that size. They got a significant jumpstart in the mid-1990s when she and Perez successfully applied for two research infrastructure grants that allowed them to expand their snake collection and fund more snake hunting trips. In 2000, the Texas A&M University System Board of Regents officially designated it the Natural Toxins Research Center. In 2008, the word “national” was added following the approval of a federal grant, which has since been renewed twice, establishing it as the only federally funded viper resource center in the country.